Safeway Tub Door – Installed for just $1,295! Safeway Tub Door® is a product and installation tub cutout method designed to provide an economical renovation option for individuals and facilities interested in easier access into the bathtub area through a tub cutout. Eliminates the need to remove the existing tub. Installed in the existing tub. Bath Step – Installed for just $995! Safeway Step® is a product and installation tub cutout method designed to provide an economical renovation option for individuals and facilities interested in easier access into the bathtub area. 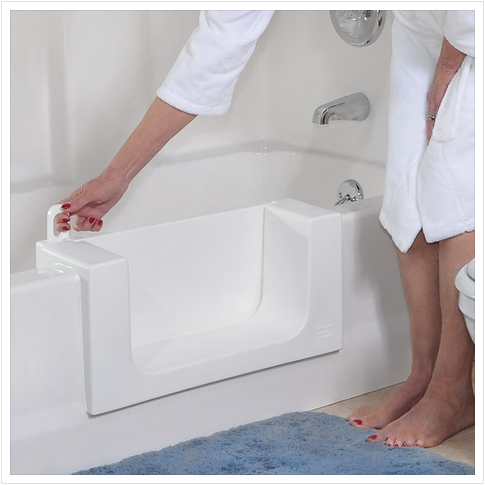 The Safeway Step® can be used to retrofit your bath tub into a walk in shower.